Blackhawks: Leaders. Legends. The Ultimate Team. -Jonathan Toews, Blackhawks Team Captain, speaking at the Stanley Cup Celebration on Thursday, which drew over 2 million fans. Winning the Stanley Cup is an impressive accomplishment for any NHL team. Winning it three times in six seasons, as the Blackhawks did in Game 6 on Monday night, truly sets teams apart. What can leaders learn about sustaining success from this year’s Chicago Blackhawks? Begin with the team in mind. The Blackhawks have built a winning team with seasoned players, rookies, and a deep bench. They also have a coaching staff and front office that works hand-in-hand to support their efforts. What does the mix of seasoned and new players look like for your team? Do you have the right support teams in place to sustain success? Create a shared vision of success. This can be deceptively challenging for teams that have already enjoyed great success. The “what” is often straight forward, such as winning the Stanley Cup. The “how” can be more difficult. Successful may rely too heavily on what worked in the past, even if that’s not the right strategy for what’s happening now. If your goal is to keep winning, how willing are you to try new strategies? How will you work together to achieve your vision? Turn challenges into opportunities. The Blackhawks have seized critical opportunities – both on and off the ice. NHL.com Correspondent Brian Hedger shared one such example in his recent post, Five reasons Blackhawks won the Stanley Cup: “With Kane placed on long-term injured reserve [in February 2015], the Blackhawks had enough salary-cap space to acquire defenseman Kimmo Timonen from the Philadelphia Flyers, center Antoine Vermette from the Arizona Coyotes, and forward Andrew Desjardins from the San Jose Sharks. The extra depth paid dividends in the postseason.” Does your team see challenges as potential opportunities? How opportunistic is your hiring? Communicate and hold people accountable. Communication and accountability are important for short and long-term success. The Blackhawks excel with both aspects, particularly from a coaching standpoint. According to Blackhawks Head Coach Joel Quenneville (Coach Q), in a post-game interview with NHL.com on Monday, " [We've] pretty well kept the same approach, how we work with players, how we deal with individuals [and] communication lines," Quenneville said. "The important thing is, it's about the team, accountability…" Are your communication and accountability skills operating at a level that will sustain team success? If not, what adjustments can you make? Every player has a role. One of the most joyful moments following Monday’s win occurred when team captain, Jonathan Toews, chose retiring 40-year old veteran, Kimmo Timonen, as his first teammate to take the cup for a ceremonial skate. 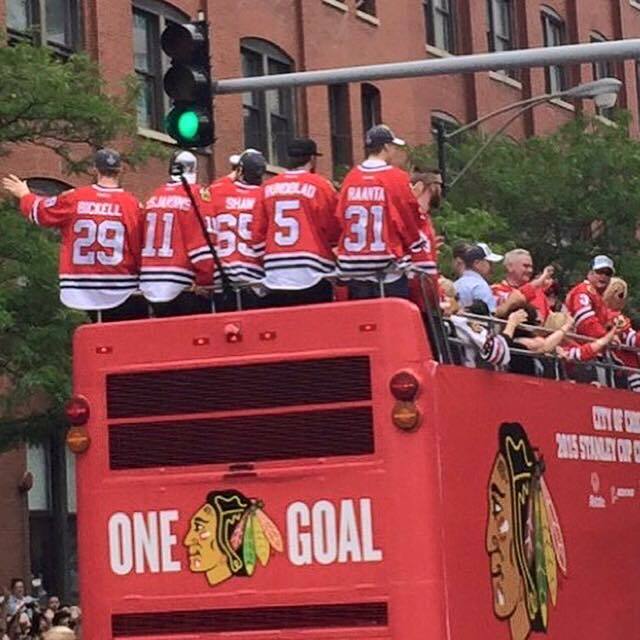 This gesture reflected the Blackhawks’ generous team spirit and a success factor for sustaining success – utilizing everyone. Kimmo was a late season trade who brought strength to the Blackhawks bench. Speaking with ESPN.com after Monday’s win, Kimmo said, "I leave this game as a Stanley Cup champion. And I can’t ask for anything more than that." How can you more fully utilize your team’s skills and talents? Do you have any Kimmo’s on your team whom you could utilize differently? Win one game at a time. Successful teams play one game at a time. This theme echoed throughout pre- and post-game interviews during the playoffs. While players always expressed belief in their ability to win, everyone knew the journey required stamina and patience. Winning happens one game at a time. As a leader, what can you do to break down the vision into achievable goals? To win one game at a time? Have the right coach. Coaching plays an important role in making successful teams even more successful. Speaking of Coach Q with NHL.com, hockey commentator and former Blackhawks forward, Jeremy Roenick, said, "He's got the perfect mentality for a coach, because he has the ability to press buttons when buttons need to be pressed, whether they're negative or whether they're positive…You need to have a fire if you're a coach, and you can tell by watching Joel on the bench how much fire he has in his belly, the love and the passion he has for the game." Do you have the right coaches to sustain success? Celebrate success. Sports teams bring cities together. Thursday’s parade and ceremonies at Soldier Field were a great celebration for the Blackhawks, the city of Chicago, and their fans – living reminders of what sustained success looks like. When your team wins together, how are you celebrating success? The Blackhawks have built a legacy that the NHL, Chicago, and the fans will remember for many years to come. Legacies start with winning teams. If you could use some help building a winning team, ECC can help. Give us a call at +1.847.920.0190.